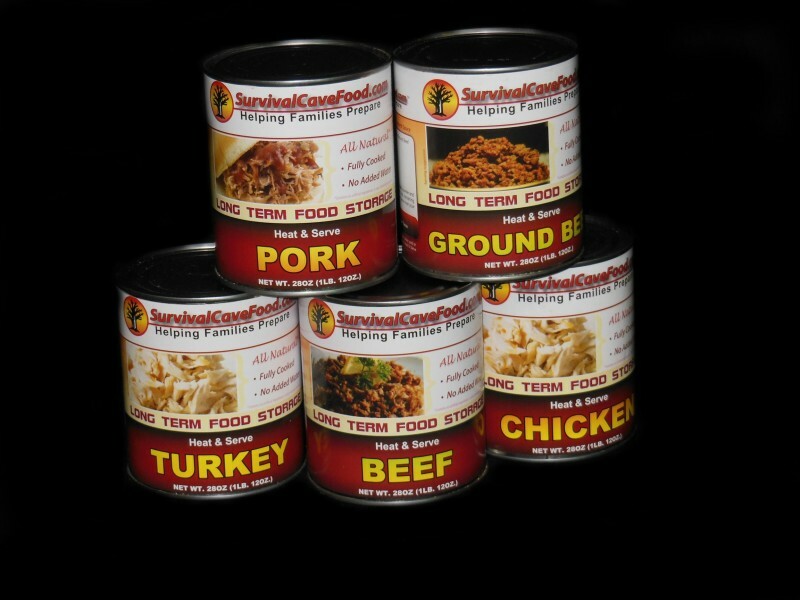 Survival Cave has put together this variety pack of great tasting canned meats. With a total of 12 cans of meat, you’ll get 108 servings of great tasting, long lasting food. It is perfect for starting up, or expanding on, an emergency food storage system. You’ll get three cans each of beef and chicken, and two cans each of turkey, pork and ground beef. This meat can be enjoyed alone, or used in recipes to feed you and your family in any situation. Having this 12 can variety pack of great tasting meats will help ensure you have all the high quality protein rich food you need to get through almost any situation. Most emergencies or disasters only last a few days, so having these canned meats will be more than enough to keep your family well fed until society returns to normal. You can also stock up on these great foods to last you for months, in the event of a longer term disaster, such as a global economic meltdown. Each order comes with 12 cans, 28 ounces each, of great tasting meat. Each of these items have been pressure cooked, so you can eat them right out of the can if needed. You can also heat them up, or add them to almost any recipe to create a full meal. When it comes to making an emergency food stockpile, nothing can be better than these canned meats. They don’t have an expiration date, and can last 30 years or longer without a problem. They are easily stackable and can be carried with you wherever you go. 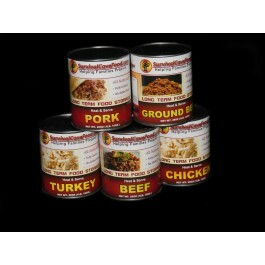 When you’re preparing for the worst, make sure you have the best canned meats available by buying this 12 pack from Survival Cave. Our canned storage meats are all natural and don't possess any Monosodium glutamate, artificial additives , fillers or chemicals. There're lower in salt, low in excess fat and healthy and balanced for your family members. USDA inspected Survival Cave Food canned meats are only made using 100% USDA inspected meats. Various other canned meats are foreign meats or state they are packaged in the USA but the meat in reality originates from other countries and are simply packaged in the US. We only use 100% USA meats!